Are you headed to the Association for Talent Development International Conference & Expo next week in Orlando? 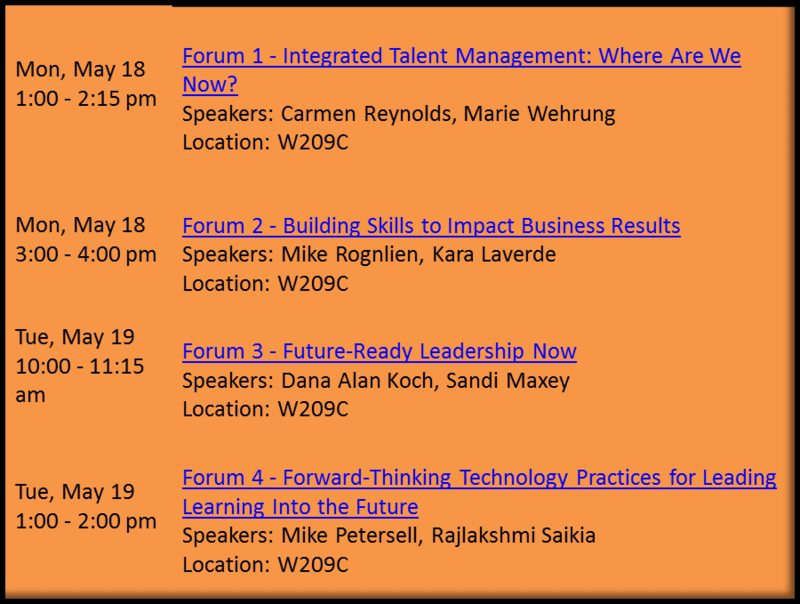 If so, you may want to check out an ATD Forum session. The ATD Forum is a networking group of senior learning and talent development professionals that share best practices and help each other problem-solve. My company has been an ATD Forum member since 2011 and I have been privileged to serve on the Forum's Advisory Group for the last two years. Each year at ICE we offer a workshop series that provides conference attendees with an experience that is a little bit different than what you get in other sessions. The Forum workshops are led by our members and are generally experiential in design. So not only do you get to discuss the topic at hand with other session attendees, you also get to experience some techniques that might be helpful when you are looking for creative ways to facilitate back on the job. Click here to add any or all of these sessions to your schedule. Or just stop by room W209C when you have some down time during the conference. There is usually a Forum staffer or two and/or a few members in the room if you have any questions about what we do and how we work together.